Find artworks, auction results, sale prices and pictures of S. Kasantsew at auctions worldwide. S. Kazantsev (Russian, 2nd half 20th century). Oil on canvas. A winter landscape. Monogrammed "SK" (lower right). 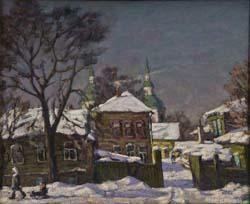 Signed in Cyrillic, dated and titled on the reverse "S. Kazantsev. 1993. Irkutsk". 50 x 60 cm. Framed.